It’s spring again and so we get the pressure washer out and start making the house, driveway and garden ready for summer use. 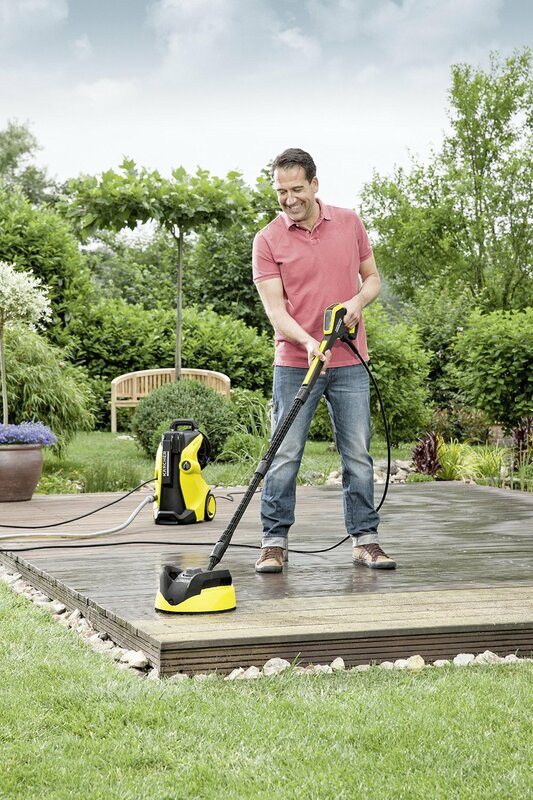 The Kärcher K5 Full Control Home Pressure Washer is one of the most advanced and environmentally friendly pressure washers in the Karcher line-up. It is German engineering at its finest. This mid-range unit is great for practically any domestic environment. The pressure washer can manage a whole range of cleaning tasks including paths, patio, and decking, walls and garage doors, plus car washing. The unit also comes complete with the T350 T-Racer, a patio and path, decking and vertical surface cleaning attachment from Kärcher. Other accessories include the variable pressure lance for general washing and low-pressure detergent application; dirt blaster that increases cleaning power by 50 per cent for stubborn spoilage and marking such as mould spots. Getting started involved partial assembly of the unit. It took about 30 minutes to put together; it does seem that there was a lot of unnecessary assembly. After that, you attach it to your water supply and attach the spray lance to the trigger gun. It is certainly lighter than previous models but still heavy enough to get tired lugging it about from one place to another. Kärcher has improved the hose position. Earlier models had the hose positioned high up on the unit, the presser washer would tumble over, (and nearly always spill your detergent). Now, the hose position is lower down, meaning the unit doesn’t fall over at the smallest yank. The unit has handy storage for the hand grip and wand elements, which slot together easily and without the need for brute force. Different power levels can be chosen using a setting on the hand grip to decrease the chance of unintentionally over-pressuring wooden surfaces or your car. The trigger handle sports an LED display. This shows a Vario Power setting (2) for cars, which gives you the ideal water pressure to clean your car with. The K5 as detergent bottles that plug straight into the machine. However, it does use up a lot of detergents, pretty much the whole bottle on a single car wash. The K5 is very effective on all types of surfaces and makes short work of cleaning. It is great around wheel arches, it is very powerful and perfect for cleaning the car, decking, patio, and driveway. It has a good range of attachments, so you can extend usage if you buy the correct accessories. We would definitely recommend this one over the cheaper models if you have a significant area to cover. The K5 Full Control is a much-improved model over the older model K5. There are more attachments that assist in giving a more pristine clean, especially for the patio or drive way. This particular model comes with a bottle of cleaning fluid which was very handy. 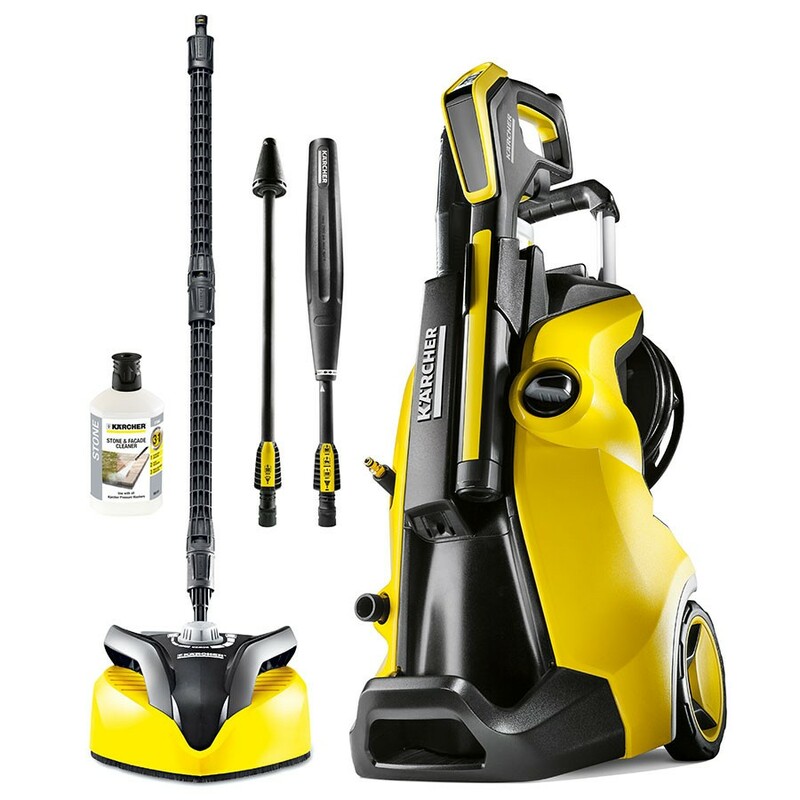 The Kärcher K5 Premium Full Control Home Pressure Washer can be bought at Amazon from £240.